Moon Chronicles is an episodic first-person shooter and remastered version of the DS game ‘Moon’. The first episode contains the first four chapters of the game along with a bonus training mission all for $8.99. The rest of the game, releasing over time, will be spread out across three more episodes for about $1.99. Gameplay in Moon Chronicles is driven by waypoints guiding you through exploration and investigation of a moon facility. 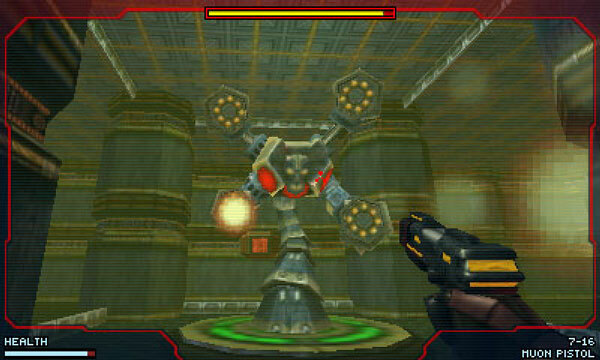 Throughout the levels you’ll be confronted by drones and spider bots along with a couple boss fights. Accessing computer consoles will give you access to more story information as you try and discover what happened to the rest of your team. You only get two guns in episode 1. The first is a SMG or Assault rifle type weapon with infinite ammo and burst fire. The recoil is ridiculous causing it to bounce all over the place and become quite hard to use. Later you get a special alien-tech pistol that uses ammo but has much more powerful shots — clearly the better of the two. Shortly into the game you’ll also acquire a little robot drone that can be used to go into little vents and open doors for you. Driving it around and shooting a little stun shot is pretty fun. 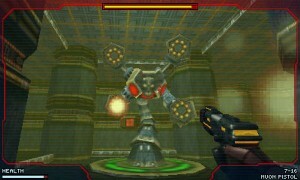 Health and ammo upgrades can be found throughout side areas of the levels providing a somewhat Metroid feel. Moon Chronicles is the only first-person shooter I can think of on the 3DS. There’s not a whole lot to compare it to in terms of presentation. Visuals look pretty good when you consider the limitations of the 3DS hardware. There’s a slight dated feel to them, but performance-wise the game runs flawlessly smooth at a great frame rate. My only complaint about the visuals is tied to some ghosting I experienced with the crosshair when 3D was turned on, leading me to disable the 3D function entirely while playing. The cut scenes are pre-rendered and not in 3D; they may be straight from the DS version. Playing a FPS on a 3DS is …. different. You aim with the stylus using your dominant hand and hold the system with the other. Using the stylus on the bottom screen moves your camera around and the analog stick moves your character. All things considered, it works pretty well. I wish that when you got closer to the edge of the screen the camera would keep going instead of having to continually swipe to keep going — I think this is considered the ‘dead zone’. Should you take that one small step? Completing everything that comes with Episode 1 took me a little under an hour, but I did go back and play everything in the harder difficulty. I’m probably at right about 2 hours of play. I know that sounds short, but if you continue to pick up the rest of the episodes as they come out you’ll end up spending about $15 — not a bad price. Season 2 coming out in 2015 will be entirely new content as well. Moon Chronicles scratches the FPS itch and provides a unique experience on the 3DS. I enjoyed episode 1 and look forward to playing the upcoming episodes and season. Renegade Kid was awesome enough to provide us a review copy of Moon Chronicles Episode 1 for the 3DS.